I hope that everyone has been having a wonderful Holiday! With New Years Eve just a few days away, I thought it would be a great time to share some super simple table decorating ideas and recipes for entertaining. If you haven't had the chance to read it yet, check out this post about a Hot Chocolate Bar Station, it's a great idea if you have children attending your New Years Eve festivities - they'll feel super special! It got a thumbs up from all the kids in Kyle's class. Whether you're hosting the evening or are looking for a dessert to bring, this Banana Cake is really delicious and again, really easy to make last minute. (Recipe courtesy of Albertsons). Add the honey to the mashed bananas to make banana jam; set aside. Turn the cake on its side and slice evenly into three layers. Place bottom layer on a serving platter. Spread with three tablespoons banana jam. Top with half the banana slices. Spread 1/2 cup whipped topping over the banana slices; sprinkle with 1/4 cup pecans. Top with second cake layer. 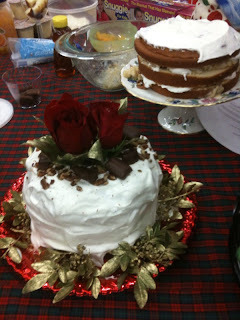 Repeat layering ingredients; top with remaining cake layer. Frost assembled cake with remaining whipped topping. Sprinkle remaining pecans over cake. Garnish if desired. Serve right away or cover and chill until ready to serve, or freeze cake for two hours (to serve partially frozen). Now you're probably running around trying to organize food, champagne, etc. and the last thing you are thinking about is decorating the serving table, right? Well, this is something you can do last minute and you most likely have everything you need (or can improvise). Take one wine glass (or champagne or margarita, doesn't really matter, it just need to have a stem) and fill it with Hershey's kisses and flip upside down on the table. Add a tea light on top and voila! (picture is shown with a Christmas style filling, but you get the idea of how simple, yet elegant it looks). Another idea is to take a margarita glass, fill it with Hershey's Kisses and a candlestick. Add in a few sprigs of gold or silver if you have them. That Banana Cake looks YUMMY! Have a Happy New Year and thanks so much for stopping by Theta Mom! I look forward to blogging with you! That's my kind of baking - yum! Oh my gosh...I can't wait to try the Banana Cake recipe. It looks delish!